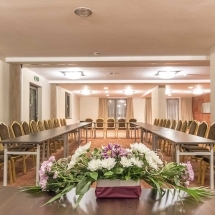 Hotel LION Borovetz offers exceptional conditions for business meetings near Sofia City (60 km.) and is an excellent choise for international and local events. 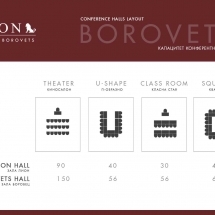 The hotel has two confrence halls – “Lion” Hall with maximum capacity of 100 seats and “Borovetz” Hall with maximum capacity of 150 seats. Both rooms are naturally lit but also have blinds for darkening the room if necessary. 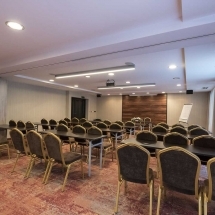 The modern technical equipment includes wireless internet connection, sound system with wireless microphones, multimedia, flipchart. 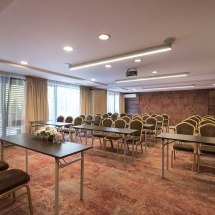 The work-shop room is with capacity of 15 seats and is a great option for work-meetings, trainings or work in team-buildings. 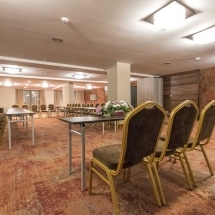 Do not hesitate to contact us for comments, questions and any other additional information or cooperation needed!